Poppy White. 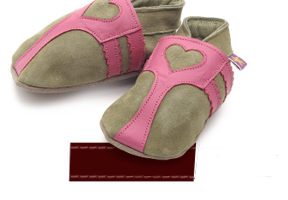 Girls soft leather baby shoes in White, Pink poppy flower design. Carmina Jade. Girls soft leather baby shoes with carmina flower design in baby blue and white on jade shoes. Stargazer In Jade. Girls soft leather baby shoes with stargazer lilies design in candy and pink glitter on jade shoes. Ballerina Red Metallic Girls soft leather baby shoes, low toe red ballet style shoe with red silk rosebud and red satin laces. Cherry Blossom In Red. Girls soft leather baby shoes with white and pink blossom flowers with chocolate stems on red leather.